Imagine if the Ramones and the Beatles decided they were going to form one band. Now imagine if they only sang in Japanese. Are you with me? Because that’s the only way I can describe the 50 Kaitens. 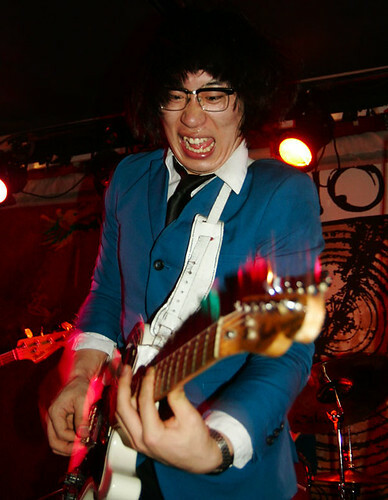 I saw them last night at Pianos and I was left utterly speechless by what I saw. They had an out-of-control frenetic energy, jumping around the stage as if something was going to electrocute them if they stayed on the ground more than 5 seconds. It was unbelievable. Decked out in matching teal blue blazers, white shrits, black ties, and skinny black pants, they could probably give The Hives a run for their money in the style department. They made the most ridiculous “rock god” poses throughout the show, but in combination with Rodney Dangerfield-esque bug-eye facial expressions. I honestly do NOT remember what I heard, or what even happened during that performance–it’s all a blur. But what I can say is that it’s a sight to be seen. They are fantastic entertainers, a remarkably tight band, and hysterically funny. 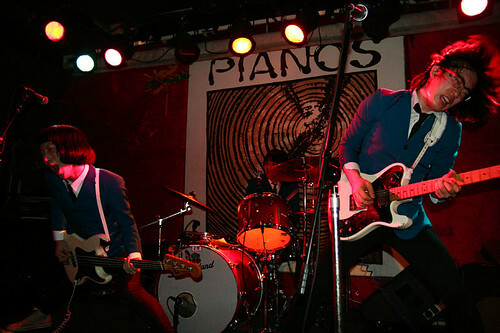 You can catch them again at Pianos on Monday…if you dare to be rocked. Thanks for the heads up. I saw the show on Monday and was completely blown away by the energy. I am always amused to see Japanese parodies of western culture. I LOVED IT! Thanks again.